Motor Vehicle accidents cause tens of thousands of injuries every year which impacts not only the person in the crash, but family, friends, classmates, coworkers and more.. Car accidents are very traumatic and can often lead to severe and debilitating injuries such as neck injury, back injury, spinal cord injury, paralysis, whiplash, chronic pain, burns, nerve damage, spinal cord paralysis, broken or dislocated bones or limbs, the loss and/or the use of a limb and even death. The statistics for car accidents nationwide are staggering. Negligent, reckless, impaired, and distracted drivers are the frequent cause of car accidents. Impaired or drunk driving: Every day, almost 30 people in the United States die in motor vehicle crashes that involve an alcohol-impaired driver. This amounts to one death every 48 minutes. In 2010, 10,228 people were killed in alcohol-impaired driving crashes, accounting for nearly one-third (31%) of all traffic-related deaths in the United States. Distracted driver: talking on the phone, eating or texting while driving,. In 2011, 3,331 people were killed in crashes involving a distracted driver and an additional, 387,000 people were injured in motor vehicle crashes involving a distracted driver. Sending or receiving a text takes a driver's eyes from the road for an average of 4.6 seconds, the equivalent-at 55 mph-of driving the length of an entire football field, blind. If you are injured in a car accident, the damages you can recover include: medical expenses, pain and suffering, physical impairment, lost wages because of the injury and property damage. You can also file a wrongful death claim if you have suffered losing a loved one in a car accident. A factor in determining the damages you can recover is the negligence or breach of duty of each party. According to Texas law, you may recover even if you were partly at fault for the accident. However, you cannot recover any compensation if you were more than 50% at fault for the accident. Jimmy C. Bailey is prepared to bring forty successful years of ability, expertise and resources to recover monetary compensation for each injured client as a result of damages and injuries suffered and lost – including medical bills for treatment of injuries, lost income, disability, disfigurement, loss of enjoyment of life from pain and suffering and loss of daily activities. 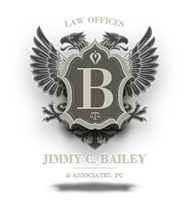 At Jimmy C. Bailey Law, we treat each client and their case with skilled, compassionate understanding providing a background of aggressive success to achieve the fullest recovery for each client depending on each individual’s injury and allowed damages. After a car accident it is important to remember to remain calm. It is not unusual for accident victims to be in shock and experience feelings of anger or fear.The shock period can often mask serious or mild injuries, and the injured will not feel any pain. If you're in an accident you need to seek immediate medical attention.Car accident victims should call 911 to report the accident and any injuries. If you are injured, seek medical treatment as soon as possible. If possible, all the vehicles involved should be moved to the roadside to help avoid a second accident..